It would be one thing if the Fed knew it could achieve what it wanted to achieve by virtue of its policy actions. But it’s not nearly that simple. What’s more, the US economy, situated within the vast backdrop of the global economy, has innumerable inputs, variables, influences…it’s not as if you can change one thing (like an interest rate), directly affect one other thing (like inflation), and leave all else unscathed. Given all the interference in the markets wrought by decades of Fed policy, at this point trying to undo it all would be like unmixing cake batter. But the Fed soldiers on, figuring that just a little more or this or a lot more of that is all that’s missing in its fatally flawed recipe. There seems to have been no correlation or even a negative correlation of the Fed conjuring nearly $4 trillion with which to buy (and sell) unprecedented quantities of Treasury's (particularly the 5 to 10 year variety), and the direction of interest rates. In fact, the lowest rates seen on the 10 year were while the Fed was systematically rolling off $450 billion in 5 to 10 year debt in mid 2016! 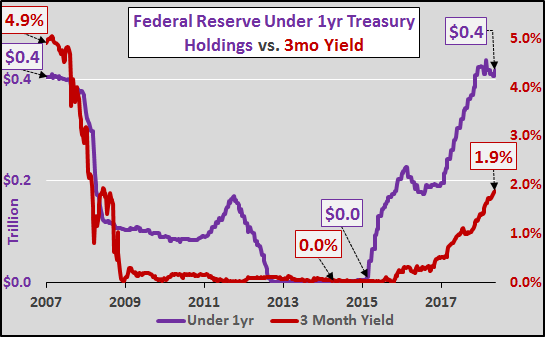 Regarding the short end, as the Fed dumped short duration holdings amid Operation Twist, interest rates fell to zero...and as the Fed began buying, interest rates surged. This is entirely contrary to the nature of a free market...and that should be the real takeaway.